The First Video Game To Feature Point-And-Click Mechanics Was? Who Was The First Recipient Of Texting Slang "OMG!"? If you’re a fan of point-and-click adventure games, it would be easy to think that the first game to feature the mechanic was one of the iconic late 1980s/early 1990s-era titles that put the genre on the map like Maniac Mansion (1987), HeroQuest (1991), or The Secret of Monkey Island (1990). We certainly wouldn’t hold it against you for overlooking the earliest developments in the genre. 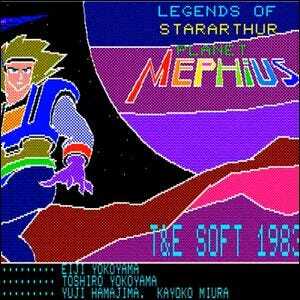 So early, in fact, they date all the way back to an obscure 1983 title Star Arthur Legend – Planet Mephius, the first in a series of video games in the Star Arthur Legend franchise—a space opera trilogy that adapts the legend of King Arthur to a distant future where the tale unfolds with space ships, interplanetary drama, and, naturally, a really cool sword. While the game didn’t enjoy widespread success in the way that future titles like The Secret of Monkey Island would, it did introduce two key game mechanics that would pave the way for the blockbuster point-and-click games of the 1990s. Planet Mephius had an on-screen command menu system that you could easily click with the mouse (to trigger actions like talking with a game character or leaving a zone) as well as a point-and-click interface that allowed players to click the mouse cursor directly upon onscreen objects to find clues and interact with the game. The latter innovation would prove to be highly influential and began the trend towards interactive environments where players could click to their hearts content to find critical clues, jokes left behind by the game designers, and otherwise navigate the game with just a mouse.